There is very little going the Treasury bond bears' way this year. They could not even be saved by a hawkish FOMC statement yesterday. Looking North, the Bank of Canada decision may be better explained by the downward revisions to job creation in 2014. Bottom Line: At this point, the Fed does not see market turbulence as an impediment to raising rates. They are willing to hike rates even if stocks are moving sideways (which they probably think is reasonable in the context of expectations for less monetary accommodation). They do not see any data that threatens their baseline forecast. Maybe market participants have written off June, but for the Fed, June remains very much on the table. My only observation with regards to Fed watching is that I find it amusing that TIPS breakeven inflation rates (my primer) have been downgraded to "inflation compensation". The Hawks were very eager to trumpet higher breakeven inflation "expectations" when they were going up, yet they get downgraded to "inflation compensation" when they are falling. I can somewhat sympathise with this: inflation breakeven rates were highly distorted during the financial crisis. However, this just looks to me like the Federal Reserve whistling past the graveyard when Mr. Market is telling them that they are making a policy error. That said, one of the plausible arguments for the Treasury rally is the ongoing race to negative yields across Europe (outside Greece...). And to be blunt, there are a lot of bond managers saying that. 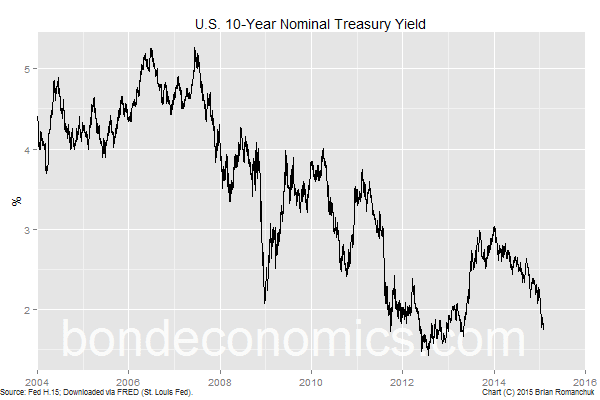 This appears to contradict my stance that rate expectations determine bond yields. We can only hope to "explain" the fair value of bond yields, not every wiggle. Bond fund managers can follow dubious valuation theories in the same way as equity managers. Bond managers have more faith in intra-country spread models than they have in their ability to forecast forward rates. (Given the massive autocorrelated forecast errors in forward rates, this is reasonable.) This can explain the deviations from "fair value". The 5- to 10-year belly of the Treasury curve is now in direct opposition with the Fed's view of the world. The outcome appears dependent upon developments in areas that I do not follow very closely (the Euro area and the oil market), and so I have little conviction on a forecast. This seems like a good time to look at relative value trades, not heroic directional strategies. Bank Of Canada Cut Triggered By Job Revisions? Statistics Canada revised down job growth in 2014 yesterday. Annual employment growth was estimated to be only 0.7%, and the number of job losses in December were revised upwards. Policymakers at the Bank of Canada should have been aware of this revision, and this could explain the cut in the policy rate (that I viewed as a policy error). One can interpret the move as Stephen Poloz jumping in front of a mob, and calling it a parade. Even with this news (and the relentless drum beat of high profile job cuts), I still think the cut was a mistake. I am a traditionalist in many things, and the traditional role of the central bank is to pretend that everything is fine, and only cut rates once the economy is obviously already in recession. Given that the policy rate started at 1%, there is no chance that they could tactically cut rates and avoid a recession. The Canadian financial system does not appear to function in a way to transmit interest rates below 0.50%. For example, the big Canadian banks did not lower their prime lending rate for a few days, and even the ones that did failed to match the full 25 basis point cut (they cut by 15 basis points). This rate cut only matters in the funding markets, and will not reach borrowers. And beyond rate cuts, unconventional policy offers little. Quantitative Easing would be an extremely bad idea in Canada, although that has not stopped central banks in the past.